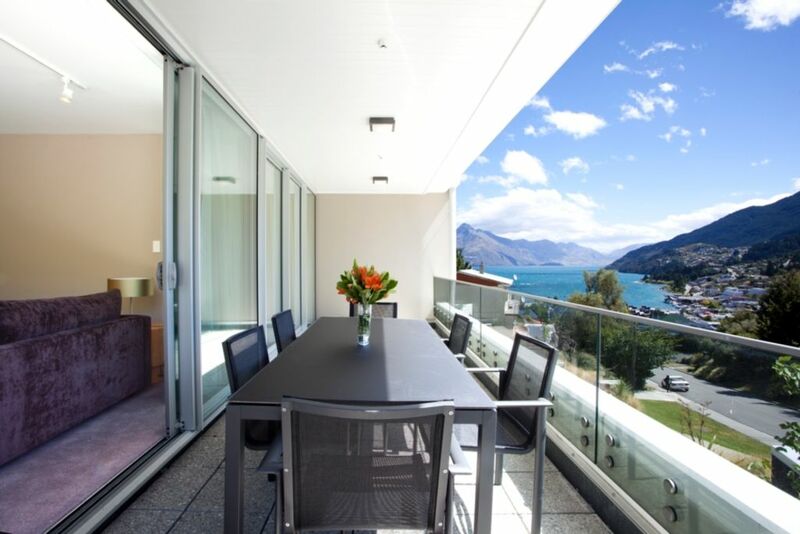 Our 2 bedroom, 2 bathroom accommodation is a 10 minute walk / 2 min drive to the heart of Queenstown with lake and mountain views. The apartment receives a good amount of natural sunlight in both winter and summer months, making it warm and cosy year round. The apartment sits in a quiet, well designed and maintained complex. The apartment features a full kitchen with a lounge area, gas fireplace and dining room with seating for up to six, making it perfect for families, small groups and couples too. With ideal views and close proximity to town, you will be able to come and go as you please. Kent Streets kitchen is equipped with the essential items you will need to cook a great meal during your stay. You will be able to enjoy our complimentary gift basket full of local and regional deluxe items to get you going and refresh you from your travels. The rooms are tastefully decorated to reflect the South Island’s charm. The kitchen is stocked with modern appliances, a homely lounge with flat screen, Sky TV, washing machine and dryer and a balcony to take in the fresh mountain air. Please advise us of your preference when making your booking. We want to create an environment where you and your family can relax while enjoying the comforts of home. Please feel comfortable using what ever you like within the apartment. We prep the apartment before you arrive leaving it with clean linens and towels. During your stay the apartment will not be serviced. If you require servicing please arrange this prior to arrival and we can advise you of the charges you will incur for this request. We use only green and organic cleaning materials and supplies to ensure we are doing our bit for the environment. A short walk from the town centre , well equipped with a great view off the balcony and nice and quiet . Thanks for leaving a great review - glad you enjoyed your stay with us. Location is close to town but on a steep hill. Accommodation was great. Accurately portrayed. Would definitely consider staying here again if/when we return to queenstown. Great balcony and views, and well equipped in a central location. Great balcony and views, and well equipped in a central location. Slightly worn in kitchen and some furnishings which stopped it being 5 stars, but very comfortable stay. Exceptional apartment with two large bedrooms and separate ensuites. Exceptional apartment with two large bedrooms and separate ensuites. We were traveling with another couple so enjoyed the spaciousness and kitchen facilities. Very Nice. It was a steep but manageable walk from town restaurants and shopping areas. We would recommend this property. Top location, amazing views and well set out.